The gallery performances are the first phase in a project that will later be performed on stage. Choreographers and Artistic Directors Yossi Berg and Oded Graf started collaborating in 2005, when they founded the international dance company Yossi Berg & Oded Graf Dance Theatre. They have since built a reputation for work that is supremely physical, sometimes provocative, and by turns poignant and witty. 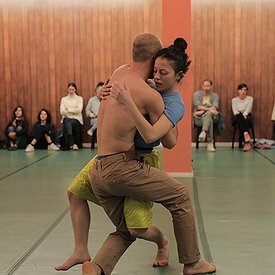 Having performed with world-renowned troupes, including Batsheva Dance Company and DV8 Physical Theatre, they mix a masterful physicality with a dynamic research of theatre, text, and voice. Responding to the social and political realities of contemporary life, they offer new ways of looking at dance and exploring performance. Berg and Graf’s company is touring extensively in prestigious festivals and venues around the world: Montpellier Danse France, American Dance Festival, The Joyce Theater NYC, DansensHus Stockholm, SIDance South Korea, The Place Theater London, Lausanne Danse Switzerland, The Museum of Contemporary Art of Rome, Israel Museum in Jerusalem, and JCDN Japan, among others. They have created work for opera houses and won numerous choreography awards. They received Israel's Ministry of Culture Award for Outstanding Choreographers and were awarded the Rosenblum Prize for Artistic Excellence in the Performing Arts.